Good location: next to shopping area, not far from town centre with tramway nearby too. Room bright and clean. Bed comfortable. Staff very helpful and welcoming. Secure car park. Good choice of items for the buffet breakfast. Overall excellent value, pity there was a dillivery at 5oclock in the morning, which woke us up. I had to close the window to shut out the noise of the offloading. Quick check in, the employee in the desk was nice and professional, the bed was confortable and the room was ok. The breakfast is simple but its understandable taking into consideration the price. Arrival time at 2.30 am on 26th, of December. The Staff at this hour very friendly. Offering the. Breakfast until 9.30h only!!! The room 1.Floor, clean , a few dark spot on the wall, The carpet around the shower has to be fixed. And some minor details. Maybe for 2019 time enough to fix these things. 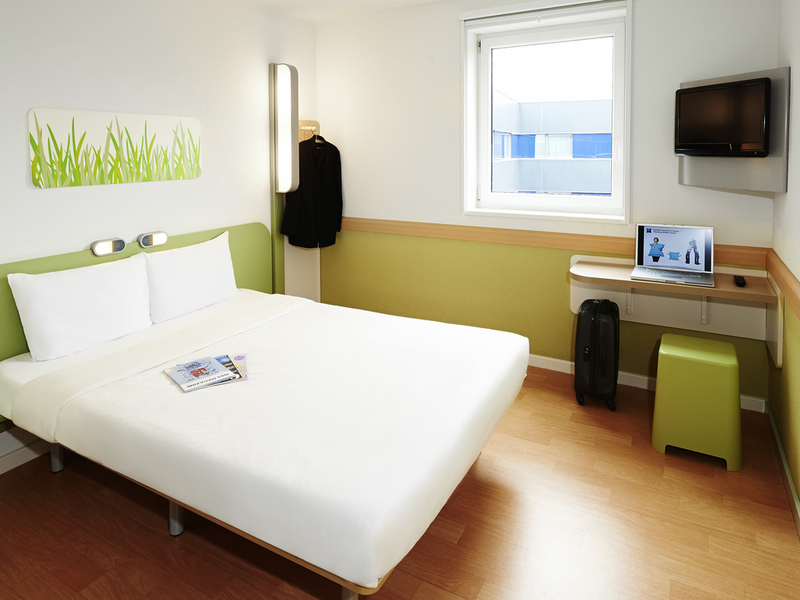 Bett comfortable as Ibis Budget Style on. In the morning between noisy guests and early morning vacuum cleaner , and staff next to my room banging several time with doors. Doesn´t care if , I have the please be quiet hanging outside the door... oh, well. On checkout I left the hotel ,not seen any staff at the front desk.... good bye. Easy check in with pleasant staff. Clean room with comfortable bed and hearty breakfast. The hotel was clean, unfortunately the window was buckled and didn’t seal properly, as we were on the side next to the trams this made it noisy, another problem was a draft coming through the window, which was very unpleasant on a cold night. We ended up putting paper that we had foldered several times in the gap on the bottom left quarter of the window, which helped with the draft but not the noise. Other than the alarm everything else was ok. I stayed with my two children on a stop over to Bergerac. The only downside to this hotel was that the bunk bed wasn’t made up. Not ideal after travelling for 11 hours, then having to make the bed. Apart from this the hotel was ideal for what we needed. There is no airco in the hotel and sleeping with open window is almost impossible when your room is situated street side (busy avenue + tramway). Don't order breakfast because it's mayhem. If you're lucky you have coffee and croissants, if you're too late (it was 8 AM) you can be happy if you find a clean coffee cup and a piece of baguette. Location was good, parking was easy, breakfast was good and the room was clean. Outside it was 36 degrees during our stay and since there was no airco, it was very warm in our room (South oriented). With the window open we had a lot of noice (located at streetside) and it was impossible to sleep. Overall I would not recommend this hotel to others for a stay during summer. Clean & comfortable for a one night stay. Pleasant staff too. We only stayed for one night, en route to the ferry, and it suited our requirements. Clean & comfortable. Easy to book, rooms correctly described and clean. I like the addition of shower gel in the bathroom - a nice touch. Friendly receptionist. Wifi terrible - my devices showed full wifi reception but I couldn't load even one web page while there. Good, solid budget hotel - easily accessible when travelling via the auto route to SW France. The rooms were clean, quiet and had everything we needed for a quick one night stop over. The hotel doesn’t have air conditioning, but it’s a budget hotel, and we knew not to expect this. The staff are friendly and helpful. All in all, a convenient and great value for money hotel. Ideal for families. Always stay her en route to the south. A clean bed, a good shower, restaurants nearby. A good breakfast in the morning. Staff always welcoming and polite. Good value. The check was quick, efficient and friendly. The receptionist was very helpful and dealt with our request qucikly. I was welcomed by name & checked in quickly. My room was clean & comfortable. The shower was fantastic after a long day on my motorcycle!